The largest music & Halloween-themed festival in the Southeast region just got larger. Presented by DiskoLab, WYNWOOD FEAR FACTORY reveals a major lineup for its second Halloween haunting Miami, FL. Possessing the ominous RC Cola Plant October 28 & 29, the stage will play host to a bevy of A-list superstars and special guests exclusively for Florida this season, including DJ Snake, Porter Robinson (DJ set), Steve Angello, Wiz Khalifa, Big Gigantic, Yellow Claw, Oliver Heldens, Robin Schulz, Martin Solveig, Cedric Gervais, Drezo, The M Machine, Bad Royale, GG Magree and more. It’s an eclectic group of talent who rarely pass through South Florida coming together under one roof. Check out the full confirmed lineup below. Not only is the lineup bigger in 2017, but the production and atmosphere expand in tandem. Creating an unforgettable and undeniable experience, WYNWOOD FEAR FACTORY will now boast haunted attractions, scare zones, entertainment, performers, art installations and vendors from Miami’s most popular food spots. 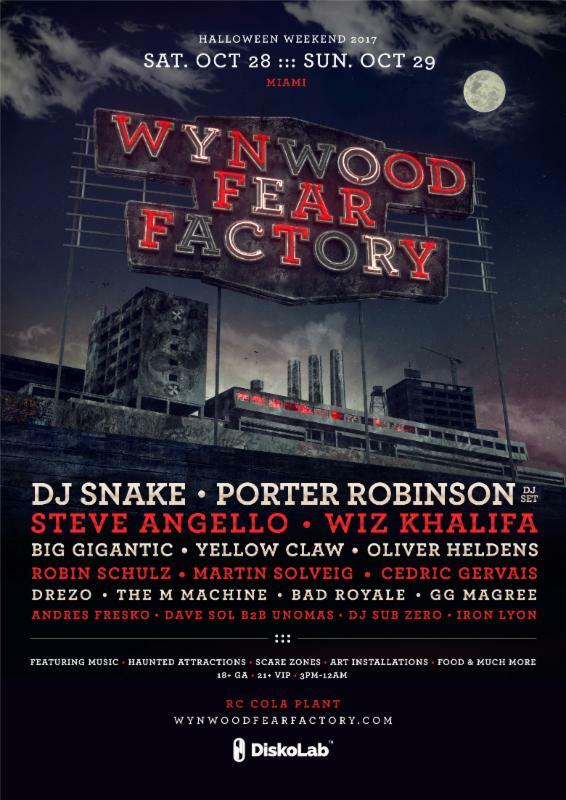 WYNWOOD FEAR FACTORY was a wildly popular event when it debutedin 2016 with performers Armin van Buuren, Dimitri Vegas & Like Mike, Flosstradamus, Adventure Club, Borgore, Benny Benassi and many more. The two-day seasonal extravaganza will take place at the “abandoned” old RC Cola Plant, located in Miami’s Wynwood Art District–the trendiest neighborhood in the city showcasing art galleries, restaurants/nightlife spots and some of the best street art. Tier 1 tickets are already sold out, Tier 2 General admission & VIP tickets go on-sale on Tuesday, August 8 at 12PM EST via www.wynwoodfearfactory.com. GA tickets are 18+ ages, VIP Tickets are 21+. VIP tickets include priority entry and exclusive access to a private VIP area with elevated viewing deck and 21+ bars, premium restroom trailers, and specialty WFF gift bag. There will also be an exclusive VIP deck for bottle service with VIP pricing to be released soon. This entry was posted in Press Releases, WYNWOOD FEAR FACTORY. Bookmark the permalink.